"Legalized Hate Out Of My State"
Galeria de la Raza is pleased to present the latest installment of our Digital Mural Project by Favianna Rodriguez. The billboard, a collaboration between Rodriguez, Roberto Lovato, and Gan Golan, addresses the Supreme Court ruling that upheld the part of Arizona's SB1070 law which allows police to profile by investigating people's status. Rodriguez and Lovato explain, "As the country starts waking up to the effects of the Supreme Court's historic decision upholding the cold heart of Arizona's SB1070 - the 'papers, please' clause - we will need to understand what it means beyond Arizona; we urgently need a deeper understanding of what's happening to our country, our community; everybody needs to understand that Jim Crow and other racism are still alive; that it is birthing another racial era, the era of Juan Crow. You cannot fight-and defeat-that which you cannot name or understand. As different laws with different names in different states begin rearing their ugly head, our common enemy must have a common and recognizable name. 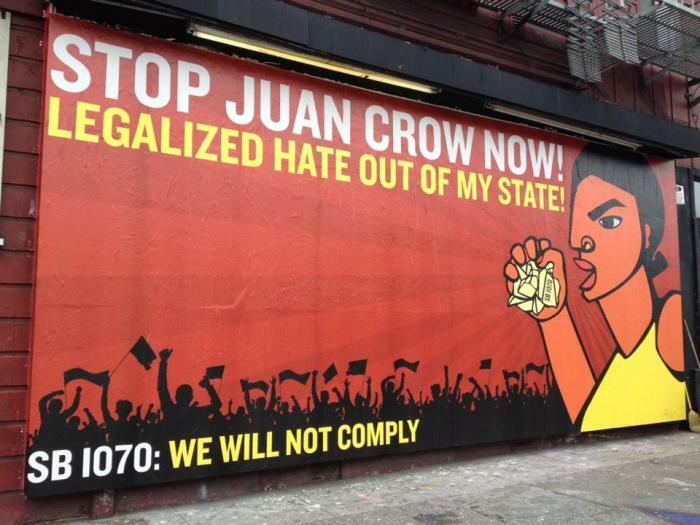 The name that will define our common struggle is Juan Crow." Favianna Rodriguez is a celebrated printmaker and digital artist based in Oakland, California. Using high-contrast colors and vivid figures, her composites reflect literal and imaginative migration, global community, and interdependence. Whether her subjects are immigrant day laborers in the U.S., mothers of disappeared women in Juárez, Mexico, or her own abstract self portraits, Rodriguez brings new audiences into the art world by refocusing the cultural lens. Through her work, the changing U.S. metropolis and a new diaspora in the arts is witnessed.